Every year the Delaware Nursery and Landscape Association selects an herbaceous plant (usually a perennial that dies back to the ground each winter) and a woody plant (usually a tree or a shrub) to designate as Plants of the Year. Plants are selected that will thrive in Delaware’s conditions and that have few disease and insect problems. If sited properly, these plants are guaranteed to succeed. These plants are often underused in the Delaware landscape. So, if you purchase one of these plants, you will be a trendsetter in your neighborhood. The 2015 selections were just announced at the Delaware Horticulture Industry Expo in Dover. This fantastic native ground cover can be found from Maine to Georgia in deciduous woods and along roadsides. White wood aster has heart-shaped leaves borne along thin, purple-black cascading branches. The cultivar ‘Eastern Star’ is shorter than the species and has deep dark shining mahogany stems. Small star-like white flowers with yellow centers are borne in profusion from mid-July into early October. It is one of the few asters that grows in the shade, but takes sun as well, so in a new planting under young trees, the white wood aster will thrive and continue to thrive as the trees cast more and more shade. White wood aster grows in average to dry soils, and works well as a ground cover at the edge of the woods or at the front of a border growing through other plants. It attracts butterflies, is somewhat deer resistant and makes a good filler in a cut flower arrangement. Ironwood is a small-medium sized, wide-spreading tree that is native to the eastern half of the United States. Ironwood, sometimes called Blue Beech or Musclewood, is named for its thin, bluish grey, sinewy bark that looks like flexed muscles. Leaves are pointed, serrated and dark green, often lustrous, in summer and change to yellow, orange, red, and reddish purple in fall. Ironwood can be difficult to transplant and should be moved balled and burlapped or from a container in late winter to early spring. This handsome tree is usually found as an understory plant along rivers and streams, where it withstands periodic flooding. 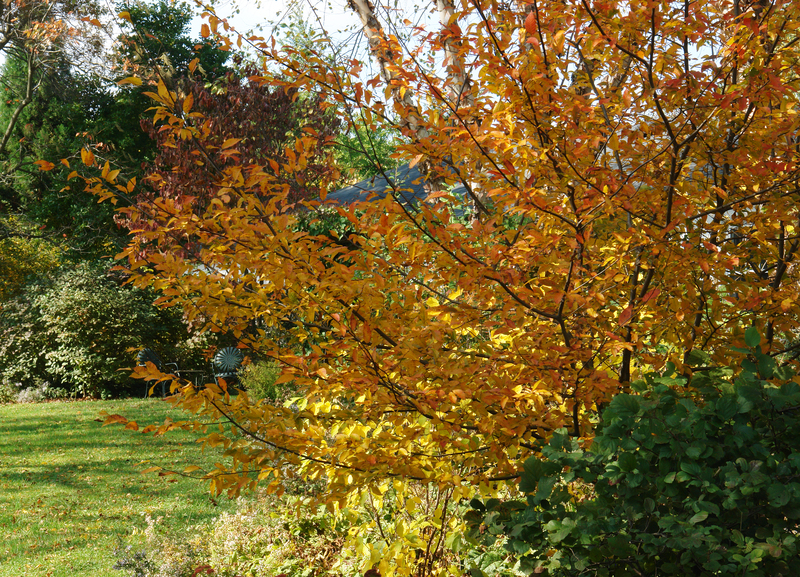 Michael Dirr has seen this tree in a wide variety of landscape settings and believes it is quite adaptable. This tree has a lot to offer our landscapes in subtle beauty.